State FCCLA Conference Inspiring, Motivating and a Celebration! State Conference 2019 will inspire and motivate students to reach for new dreams! Shadow Day 2019 was a highlight of civic engagement, meeting the First Lady of MN Gwen Walz and learning how FCCLA (FHA) influenced her leadership. FCCLA is a student leadership organization that focuses on youth, peer education and family. FCCLA empowers young women and men to be active leaders in their family, school and community by addressing important personal, family, work and societal issues. Involvement in Competitive Events programs offers the opportunity to expand your leadership potential! 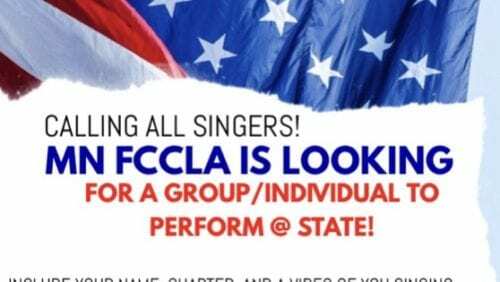 Are you thinking about joining FCCLA? Already a member? Take a look at all of the ways you can be involved! We have a lot going on! Check out our event calendar to see all of MN FCCLA's upcoming events.